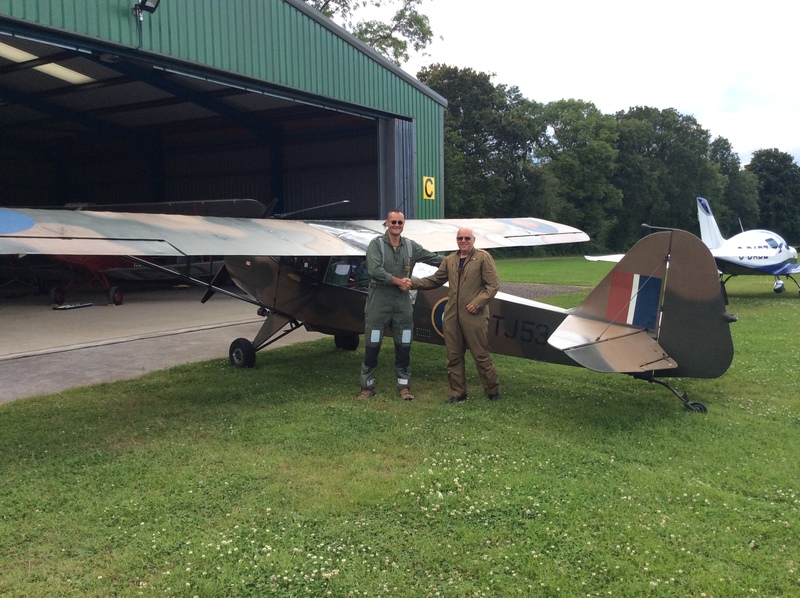 When Steve Farrant told us he’d gone and flown round Britain in his old WWII Auster we reckoned that was just the best thing to have gone and done. As small people my brother and I had quite a few flights in the London Transport Flying Club’s Auster, G-AJAC, jammed in the rear seat (read plank) sharing the seat belt with my late father so I have a real affection for them. Please could we have the story? Being the gentleman he is he very kindly obliged. The journey was originally planned for July 2013 but ongoing engine problems delayed the trip a year. 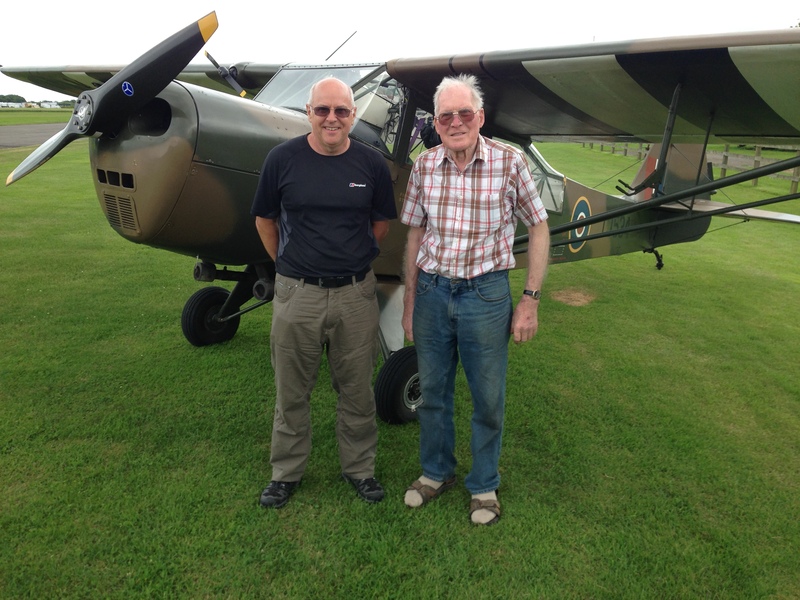 July 2014 was now the new date set for Steve and his Brother-in-Law, Richard 'Whitters' Whitmarsh, to complete a flight around the coast of mainland Great Britain in his 70 year old Auster, G-AKSY. The following article appeared in Auster Club's magazine, Auster Club News, and is written by Steve with Whitters’ words, from a non-pilot perspective, in italics. 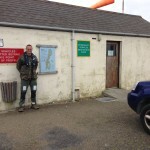 The idea was that it would be a very informal, enjoyable trip routeing anticlockwise and taking in all the sights that the coast of mainland Britain has to offer. Never having been further north than Yorkshire, I was really looking forward to seeing Scotland and in particular the West coast. Over the previous few weeks I had spent a lot of time preparing the plane and getting the permit renewed. Whilst accepting the fact that technical problems could cause delays en-route I wanted to be sure it was not through lack of preparation on my part. Whitters was due to arrive at my house on Sunday ready for loading and departure on the Monday, however whilst attending the Auster Club fly-in at Old Warden on the Saturday I noticed a crack in one of the exhausts. Damn and blast, what a time to choose. Some quick phone calls and an early return from the fly-in meant that I could get the exhaust welded and back up together on Sunday morning. We were back on track. Sure enough, Whitters arrived and I took him to see the plane and for a short flight to Popham to refuel ready for the start of our adventure in the morning. This was the first time I had seen Steve’s aeroplane. It looks fantastic for its age with only a few tell tale signs that would indicate its vintage. The instrument panel looks the part with its inverted compass and mirror to view, airspeed indicator in MPH rather than knots, the castoring solid leaf spring tail wheel, and wind driven generator on the starboard wing. Inside the engine compartment it's clean, well organised and to a novice like me looks every part a standard aero engine with the exception of some of the fittings and the cylinder block whose coats of paint and solid structure look more it's age. Steve gave me a walk around, talking through the pre-flight checks, the do's and don'ts, what not to pull or stand on, how to get in and out etc. Before very long we were climbing in for the test flight, both nervous and excited I strapped myself into the small cockpit. With the press of a few switches the propeller turned and the engine boomed into life shaking the aircraft as it fired itself up to idle speed with the fantastic sound of a prop driven aero engine of WW2. Being conventional gear, or otherwise known as a tail dragger, the view out of the front is obscured by the engine cowling which requires a zig zag technique to enable the pilot to achieve forward vision. This had me imagining I was in a Spitfire or Hurricane taxiing along the grass strip about to launch into a battle with the Hun. When the engine roared to full speed for power checks my imagination ran riot taking me back to the movies I've seen of the glory days of aviation. Accelerating along the runway, as speed picked up Steve pushed the stick almost all the way forward to allow the tail to come up. As the tail started to lift this allowed full forward view. At around 45 mph Steve pulled the stick back. I was surprised to see how much stick and rudder control movement was needed during take off. I had to ensure I kept well out of the way to ensure I didn’t hamper Steve from controlling the machine. 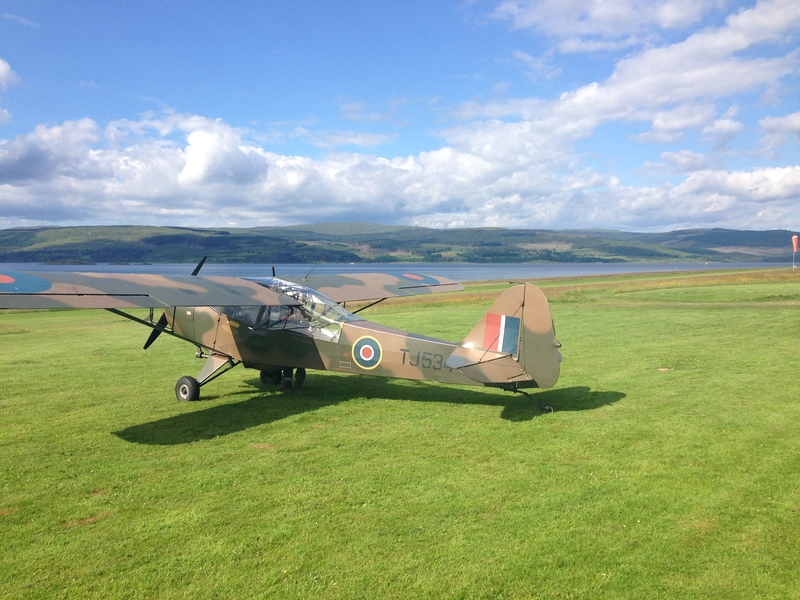 There is nothing quite like roaring down a grass strip runway in a vintage aeroplane made of fabric and wires, experiencing it roar and bounce into life as the pilot skilfully coaxes the machine into the air. It wasn't long into the flight that Steve offered me the controls. I've flown several fixed wing aircraft but nothing quite like this, we were heading to Popham at about midday and the air was fairly active, I was finding it difficult to keep the machine straight and level. Having watched Steve take off and observed the level of stick movement required, I found I was over correcting, also I didn't realise the reliance on rudder control and it's relationship with the ailerons and elevator. Most fixed wing machines, in my experience have little use of rudders when up to speed other than landing and taking off. The Auster needs a combination of rudder and stick. Trying to correct or initiate a turn using aileron and elevator only appears to produce a clumsy side slip and yaw. Apparently this is due to modern machines having differential ailerons which reduces drag and improves efficiency in the turn. Steve took control as we approached Popham, this was just an 11 min flight. 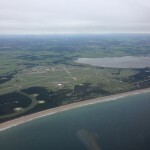 Landing on Popham’s grass runway was uneventful. Having just a castoring uncontrolled tail wheel, directional control on the ground relies on the use of rudder. However in order for the rudder to be effective it needs air flow over its surface, so, as we slow directional control can become difficult in cross wind situations. Fortunately, today's wind was light and variable and didn't pose a problem. Returning from the refuel at Popham we arrived above home base at West Tisted for a practice engine off landing from 1200 feet. With the throttle at idle directly over the threshold Steve set up a series of fairly steep turns whilst drifting down wind and levelled out for final approach. I was surprised at the glide this machine has, which was reassuring because I was expecting it to have a glide similar to a paving slab, but it can achieve quite a reasonable distance, engine off, from 1000 feet. Approaching on finals we were a little high, which in a real engine off is a much better situation than being too low. You can do something about being too high, Steve used large left rudder with opposite aileron which side slips the machine generating drag and reducing the glide, this allowed us to descend onto the desired glide path for a nice touch down on to the grass strip. All tested, just the kit to sort, check, re-weigh then we would be ready for the off first thing in the morning. The original intention was to take camping gear so that we could stay on airfields where possible, but when it came to weighing all of the equipment that had to be taken it became apparent that something, actually quite a lot, had to be left behind, and it was the camping gear that got vetoed. This later proved to be a good decision. We can normally carry enough fuel for four hours but with the weight of ourselves and necessary items we could only carry sufficient fuel for three, so planned each leg for around two to two and half hours of flying. Austers are not known for speed or comfort, so two legs in this sort of time frame would be plenty. Since we did not know what the wind or weather was going to be like over the whole trip we decided to plan each leg on an ad hoc basis taking into account which airfields had fuel, accommodation and were open at the times we needed. Home base is a private strip in Hampshire. The starting leg was to be along the south coast and round to Rochester for the first stop. Soon after takeoff it became apparent that the radio seemed to have a problem but the fault was somewhat intermittent, so we kept going, unaware that this was going to persist for the whole trip! 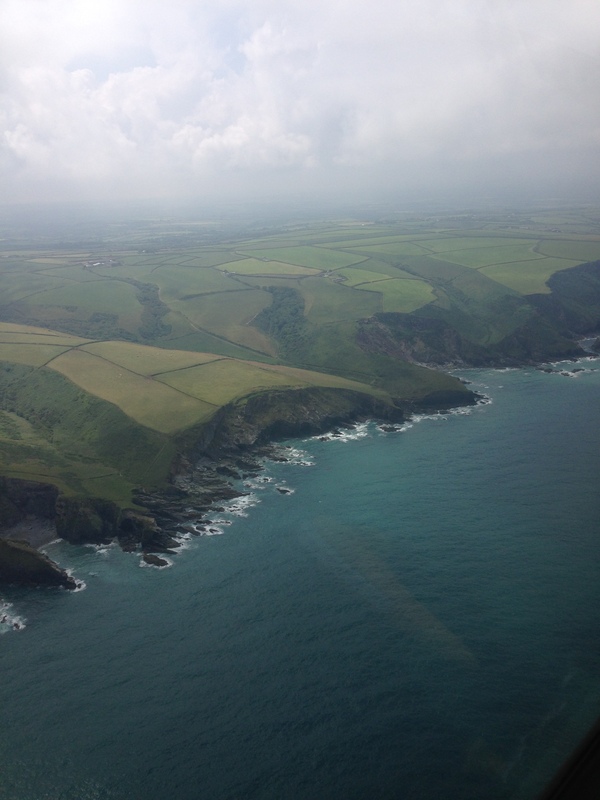 The 194 mile flight to Rochester took 2 hours and 10 mins, following the coast with the sea on our right. Passing Brighton and the South coast towards Dover we thought of the D-day preparations along this coast line and the armada of vessels and personnel involved. 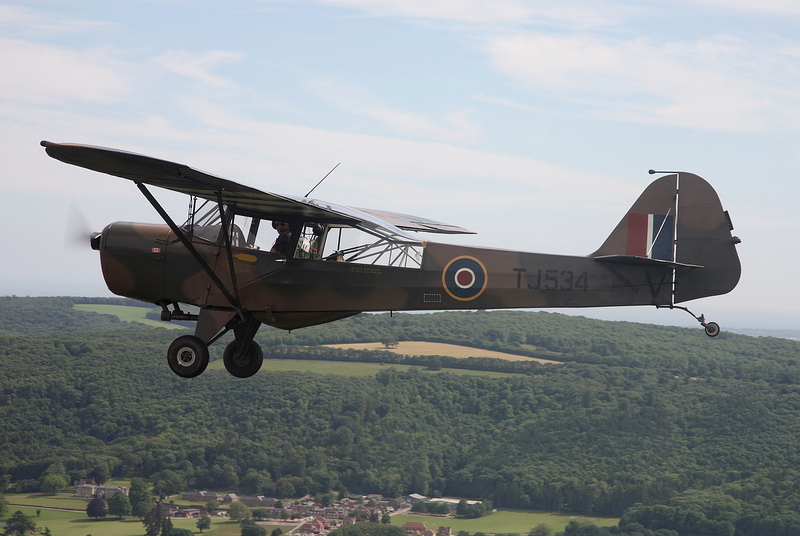 This Auster was flown by the Canadians and was used in Europe shortly after the D-day invasion flying over France, Belgium and Germany on reconnaissance missions directing gunfire and gathering information on enemy positions and movements. Here she was again flying in the same airspace 70 years later and I felt very privileged to be a passenger. The weather forecast for the week was looking good and so it proved to be. Flying past the recently closed Manston I was very tempted to go and have a fly past along this huge deserted runway. However having been unable to get any answer on the radio, discretion got the better of us, on this occasion. 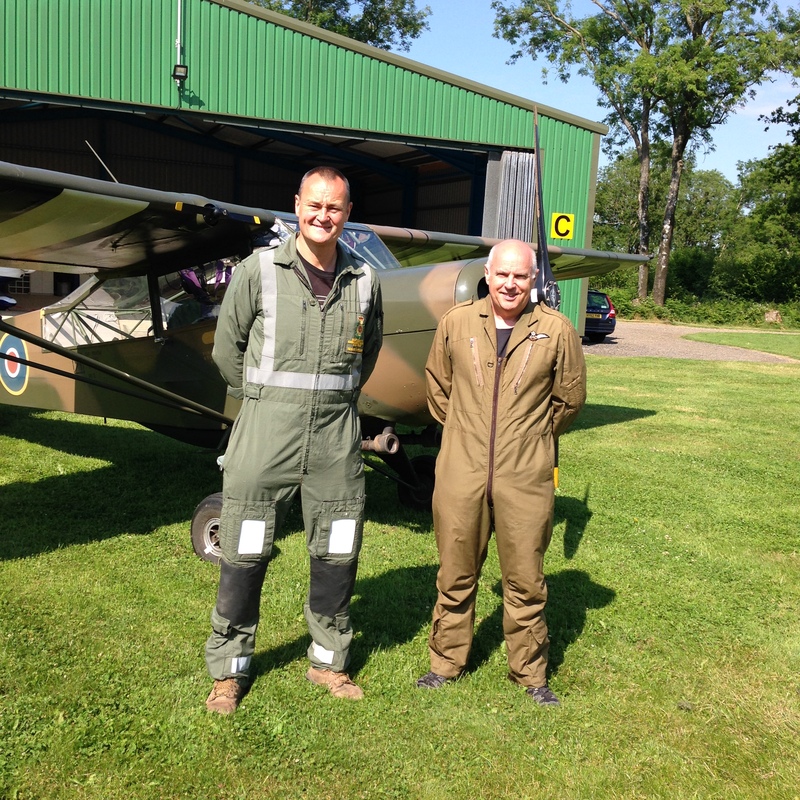 Arriving at Rochester, the guys were pleasant and helpful and after refuelling the plane and ourselves, we set off for the first overnight stop at Little Snoring in Norfolk. On approach to Little Snoring we could hear another aircraft in the circuit calling blind, but we were unable to pinpoint his location. Often at these remote aerodromes nobody on the ground reacts to radio calls from incoming aircraft, but it is still good practice to put in a blind call giving your location and intentions allowing any aircraft within the area to know each others whereabouts and avoid any conflict. 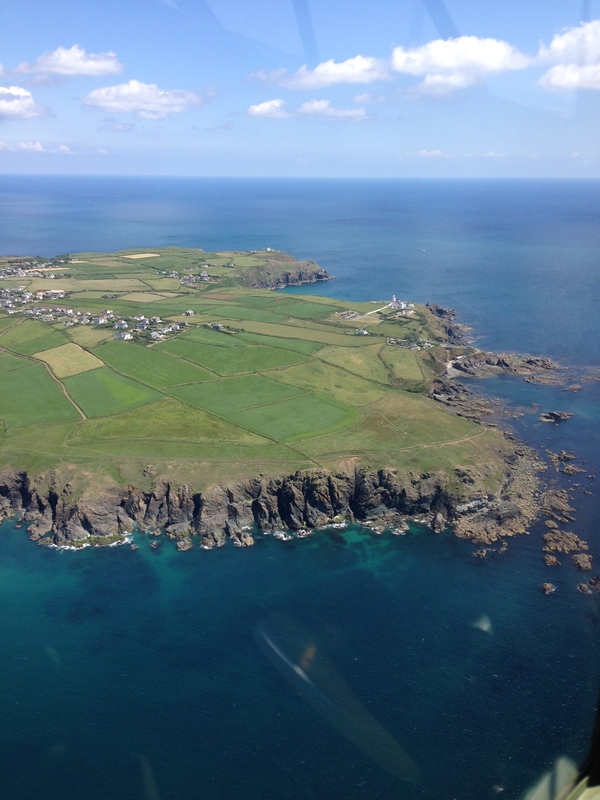 Steve gave our location and approach direction which would normally attract an acknowledgement from the aircraft in the circuit, however after several calls all we heard was a further blind call from the other aircraft who we then established was still some distance south of us. Little Snoring has a single useable runway, half asphalt, half grass. The wind direction was such that we had to use the asphalt. Unfortunately we didn't achieve the desired super smooth touch down and the surface of the runway was loose and pitted making for a noisy run on. We then had to backtrack on the same rough asphalt to exit via the only taxiway. When we met the airfield operator and explained that we were unable to establish communication with the other aircraft in the circuit, he explained that this wasn’t surprising as the pilot of the other aircraft was deaf! 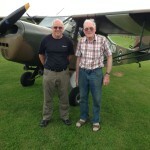 Little Snoring is the home of The Light Aircraft Company, owned by Paul and Ivor Hendry-Smith. They were extremely helpful and even gave us a quick tour of the very impressive factory where they produce the Sherwood Ranger and Escapade aircraft. We refuelled, parked the Auster, cleaned the bugs off, tied her down and tucked her up for the night. Whilst doing this we were approached by a friendly builder working on the old WW2 hanger which had been converted to a potato store. He had seen us land and came over showing a great deal of interest in our camouflaged aeroplane. We showed him around the machine and he then offered us a lift to the accommodation at a nearby pub for which we were very grateful. We arrived to find that the pub was actually closed as normal on Mondays but the landlord opened especially for us in true Arkwright, Open All Hours style. This was a rather strange pub and even stranger accommodation with an eclectic mix of furniture and fittings which looked like it had been rescued from all the houses that the landlord and landlady had ever lived in, including a pink kettle, toaster and microwave! We decided to forgo breakfast and have it at our first stop on Day Two. Next leg was to Breighton and with no other traffic on the airfield we took off from the much smoother taxiway to avoid the rough runway.From Little Snoring we hoped to get up to Eshott, North of Newcastle via Breighton near York. 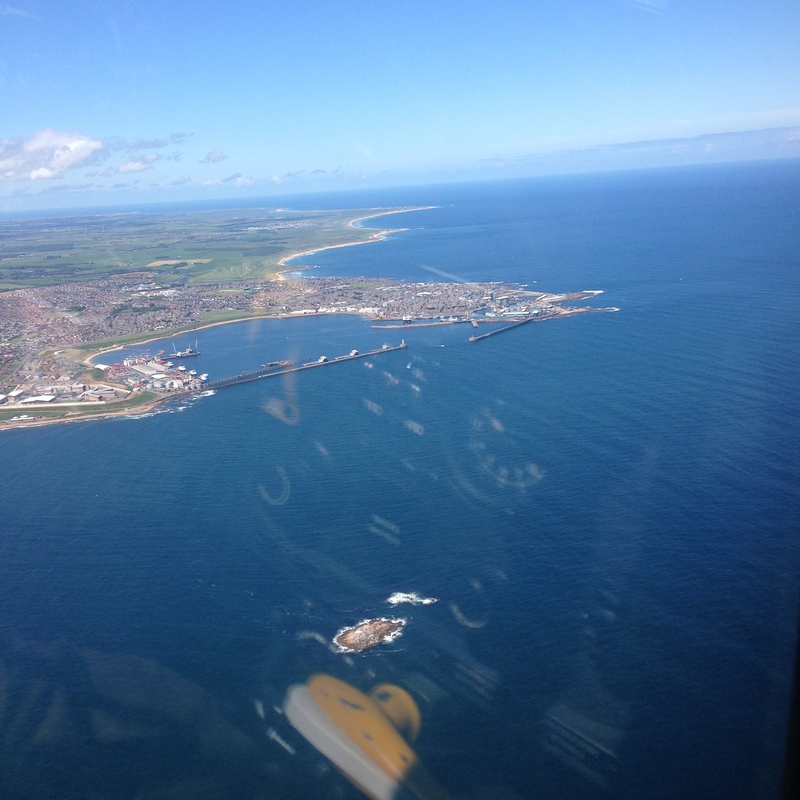 We took off in fine conditions heading West towards The Wash before heading North again flying along the holiday coastline over Skegness and Mablethorpe. Looking inland I could just make out the disused airfield of Binbrook which during WW2 was called RAF Kelstern and served as a Bomber Command operating base for several squadrons during the war. At 23.45 on Christmas Eve 1943 my Grandfather William Edmond Whitmarsh took off on Lancaster 111 LM421 CFQ of 625 Squadron and like many others during this busy period did not return. His flight log completed in his absence simply documents “OPS-BERLIN (MISSING). Death Presumed”. His Lancaster, piloted by Sgt Clark was shot down over Mittenwalde in Germany, none of the seven crew members survived. RAF Binbrook later served as a base for the English Electric Lightning, the first supersonic fighter. During the late 1960s as a young child I marvelled at the thundering noise of these incredible machines over head, my family being based at RAF Binbrook during my fathers RAF career. Following the coast past Grimsby we followed the southern bank of the River Humber towards Breighton, which is where our Auster had been restored by an amazing character called Tony Brier. Breighton as an aerodrome, like so many on the East coast has an extensive World War II heritage. The club house is a self service affair stocking all kinds of food and drinks which is very civilized. But much more interesting than this, the hangers are full of rather special aeroplanes including a replica Fokker Tri-Plane of Baron Von Richthofen fame. I was introduced to Geoff who spent some time showing me around. 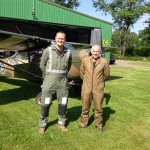 Geoff is a pilot himself and one of just a few who fly the Fokker. He describes it as a very different and difficult machine to fly, very unforgiving and almost impossible to take off or land in any cross wind as the rudder is almost useless on the ground. Tony then showed us his latest restoration, a Bucker Bestmann which is really impressive. I could have spent all week listening to Tony but alas we had a mission to complete. 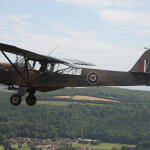 So before long we were roaring down Breighton’s grass strip waving at Tony who admitted that he greatly missed SY having restored and flown her himself for 12 years. Tony was not the only one who missed this Auster, so did the Luftwaffe in 1944. These machines often flew well into enemy territory directing gunfire and gathering intelligence, but being slow moving and defenceless they were an easy target. The crew who operated these aircraft in theatre were truly courageous men. Heading towards Eshott we were rewarded with fantastic views of the beaches and coastal towns basking in the glorious sunshine of this near perfect flying weather. En route we passed holiday towns like Scarborough and Whitby, also the larger cities like Sunderland and Newcastle. Winds remained light and we were making excellent progress, it seemed we had a slight tailwind whichever direction we flew. Eshott is another small aerodrome about 25 miles North of Newcastle. Steve was having to communicate more now with air traffic, and this was proving to be a problem due to the ongoing radio fault that had developed on Day 1. Reception was poor due to static noise. The further from the aerodrome the worse the static became which was frustrating and very tiring. 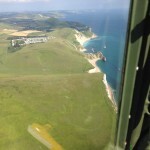 My role en-route was not only to enjoy the view and look out for other traffic but to provide Steve with navigation data from the air chart and Pooleys flight guide. This included radio frequencies and aerodrome information. The limited space in the cockpit made handling the large scale 1:500,000 air chart and the Pooleys guide a bit of a challenge, not helped by my size being 6ft 2inch and 15 stone in weight. The static noise from the radio and having my elbow knocking Steve’s glasses askew, digging into his ribs, throat and right ear frequently during this journey were elements that added to all the fun of the challenge. Eshott has two Asphalt runways with a single grass strip adjacent to one of them. On approach we were able to line up on the grass runway. This was our stop for the night. According to an App I downloaded to my phone, the nearest place that could accommodate us for the night was a pub three and a half miles away. We decided to walk as the exercise would do us good. After walking approximately three miles we realised the App was wrong and as no taxi service was available a cunning plan was needed. We stopped to ask directions with the hope we could scrounge a lift. It worked, a workman from the local dog training club drove us to the pub. Steve was jammed in the back of a car normally frequented by a rather smelly dog, but hey ho, needs as must and I was quite comfortable up front. Thanks to this kind man we were saved from a more than ten mile walk which would have been miserable. Luckily we were able to book a taxi for the journey back to the aerodrome. We were just North of Newcastle, the taxi driver, who was covered in tattoos and had few teeth, was an extremely jolly fellow and keen to see the plane we had arrived in. His very strong accent made us realise how far we had travelled from our previous stop. I asked where he was from, he said a place name in a manner suggesting that I should know it well but I could neither decipher the place name through the thick Newcastle accent nor did I have any local knowledge. I asked him again and he repeated the same unintelligible place name with a sideways glance as if to say "are you for real"? I dare not ask again, I just smiled and nodded. The next leg on Day 3 would take us over the English/Scottish border to Dundee. The plan was then a big push to reach Wick-John O’Groats for our third night stop. 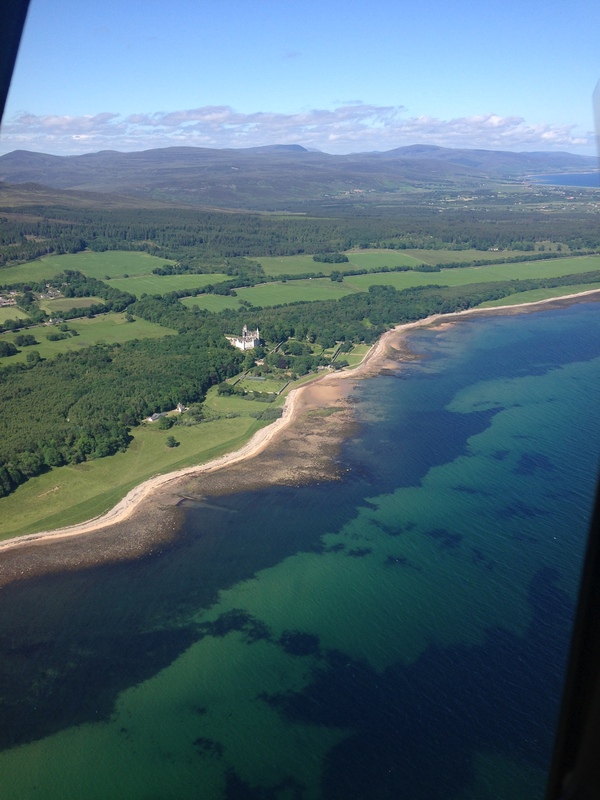 The highlands have very few aerodromes that can supply fuel so the choice of destinations is limited. 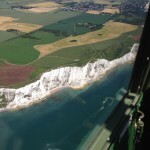 Yet again the fine weather allowed us stunning views of the coastline and with little airspace or restricted areas navigation was a more relaxed affair. For this leg we were wearing our lifejackets. The plan was to cross the Firth of Forth avoiding Edinburgh Controlled Airspace. This is a gap of some 13 miles of water which would culminate in wet feet should the engine decide to stop. In order to improve our chances just in caser this occured, we went through the drill for landing on water. Should the airframe bend on impact, which would be likely, it may be impossible to open the doors to escape, so to avoid this we would need to open the doors prior to impact. Our route across the estuary was at an altitude to maximize glide and via several large vessels which may be able to deploy a rescue boat if we were to ditch close by. A degree of tension was in the air after discussing these points and the large gap which now looked even larger. 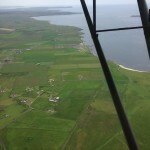 Much to our relief, we crossed without any drama then turned East to re join the coast before turning North again for a short descending flight towards Dundee passing St. Andrews Golf Course and the Tay Road Bridge. Dundee Airport is right on the waters edge on the Northern bank of the Firth of Tay. Originally just a grass strip, it now enjoys a large Asphalt runway some 1400 meters in length, the largest runway for us so far. 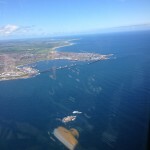 The approach was spectacular, downwind over the water for right hand base leg and turn on to final. Our little Auster must have looked tiny on final approach onto this large runway. Steve wasn’t overly happy about his touch down on this unforgiving surface. However the large tarmac surface will help on take off as we will be taking on max fuel for the long leg to Wick-John O’Groats, the next available fuel stop, via a small airfield called Easter for a break and a leg stretch. 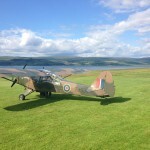 Easter airfield is a small grass strip right on the edge of the Tain Ranges. Access required some negotiating with the Range Controller and was problematic to say the least with our annoying radio. 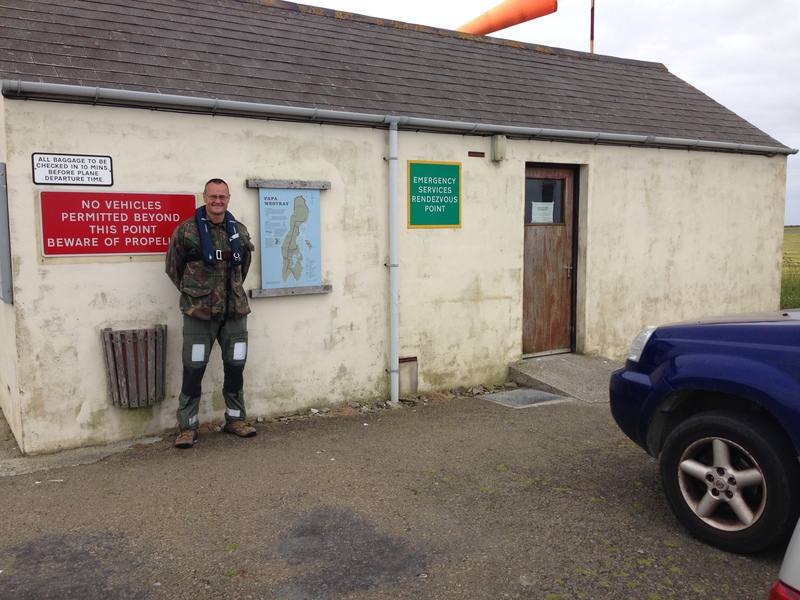 We arrived to find the place deserted but the Portacabin clubhouse was open with signs saying help yourself to refreshments and put money in the honesty box. However upon trying to boil the kettle we realised that there was no electricity. This was soon resolved when the owner David Munro arrived. Having seen us land he kindly came over and started the huge diesel generator for us. 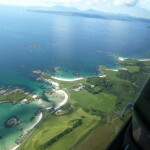 Having said our farewells it was time to try and contact Tain Range again but this was hopeless with our radio, made worse by the fact that we were on the ground. We thought we heard him say the range was cold so we went anyway. 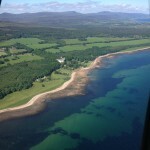 Fortunately this proved to be the case and we had a really scenic flight along the Northeast coast of Scotland including another bit of low level. I never realised that Scotland had white sandy beaches and crystal clear blue water. 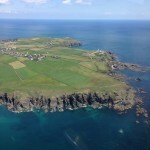 We arrived at Wick to be met by Andrew Bruce of Far North Aviation waving a box which contained the replacement radio which I had arranged with the suppliers to send there the day before. The radio was swiftly changed with much anticipation but it didn't cure the problem. Bugger!!. Andrew is nothing if not slick and efficient and he soon had us refuelled and booked into a hotel. He even drove us there and picked us up again in the morning. All of the landing and parking fees, fuel and even hotel bills were paid to him. 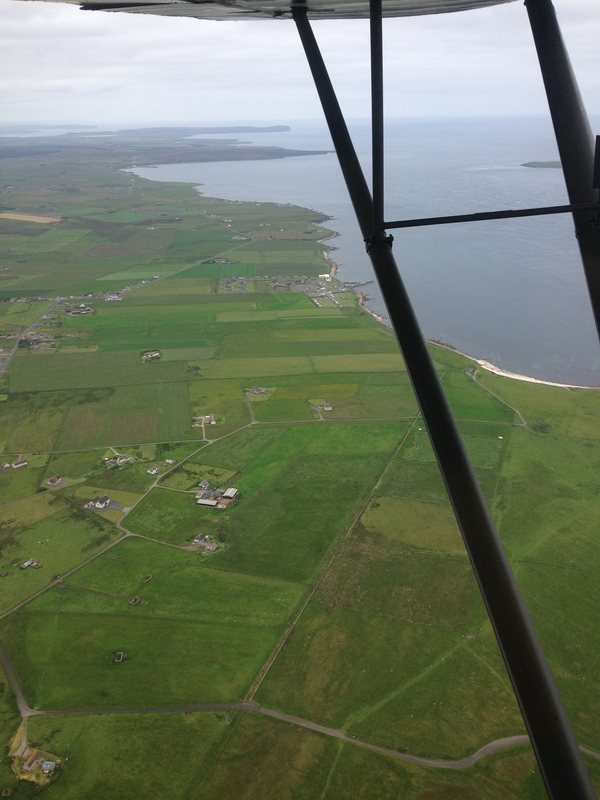 Although not in our original plan, we decided that having come this far it would be a shame not to visit the Orkneys so we took off for a 40 minute flight to Papa Westray, the furthest (and probably smallest) of this group of Islands. The airfield there is basically a gravel runway used by the Islanders on the daily service but totally unsuitable for the Auster so we had to use the short but fortunately into wind 340M grass runway. The place was absolutely deserted, including the 'Terminal' which is just a hut more akin to a railway station waiting room. There was no landing fee here unless we needed fire cover, in which case the charge would have been £31.93 + VAT. On returning to Wick, Andrew again helped us refuel and try (again) to fix the radio. This was essentially just waggling wires and checking connectors and the like as, although I am pretty good mechanically, I know diddly squat about electronics. The next leg was going to be the longest and over the most inhospitable terrain of the trip so far and I really did not fancy having no radio or having to listen to all that annoying and tiring noise for the whole flight. Eventually I decided that we were not going to be stopped by a radio. The weather, which had been so good was not going to last. This was going to be a 230 mile leg from Wick to Glenforsa and would take over two and a half hours. 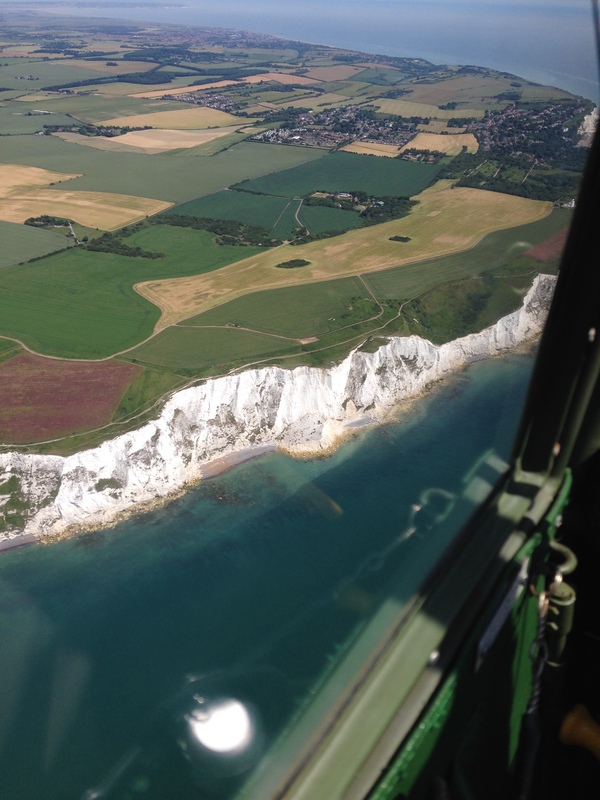 It was the leg that I was most apprehensive about due to the topography and very little choice in the way of diversions or places for forced landings if needed. At the moment, the weather was in our favour and this unloaded the pressure considerably. 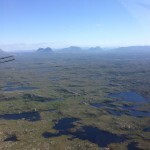 Most of the Highlands area is covered by a huge Military Restricted Area and we needed to avoid this as it was active for the planned time of our flight. The good news was that the Danger Area at Cape Wrath was inactive and this gave us room to get round. The scenery along the North and West coast of Scotland was nothing short of breathtaking. Whilst I was busy admiring the spectacular views I was also conscious that if the engine stopped we were definitely going in the water as there really would have been no choice over most of this leg. Luckily all went well and Scottish Information were extremely helpful on the odd occasion when I could contact them on the radio. Arriving at Glenforsa was one of the highlights of the trip. The grass strip is right on the waters edge and the parking area has the Hotel right up against it. As soon as we stopped and shut down we just sat there in open mouthed admiration of the beautiful view. The Auster could not have looked more at home on the grass parking area looking out at the sun setting over the water. Once we had SY tied down and covered up for the night we strolled the 50 metres to the hotel. 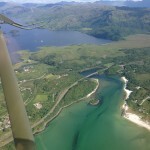 In the morning the intention was to take the short flight to Oban for fuel before the next long leg to Kirkbride. 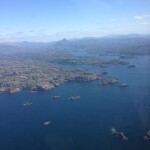 We were able to fit in a quick flight around the beautiful Isle of Mull before filling up with the most expensive fuel of the trip at Oban and setting off for Kirkbride. 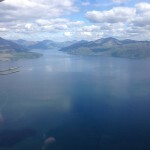 The two hour flight down the west coast and through the Prestwick Zone was again providing views of breathtaking scenery. We arrived at Kirkbride shortly after lunch and were given a very warm welcome by Chris Jones and his team. Chris runs a Gyroplane school here and has to be one of the nicest guys we met on the whole trip. We were hoping to get to Caernarfon on the next leg but the forecast was against us, it had to happen sooner or later. Despite being good weather where we were, getting past Liverpool and the Mersey was not looking good so we decided to stay here for the night. 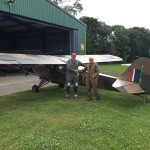 Chris soon found room for SY in the hangar with the gyros for the night and booked us into a pub. Whilst driving us there he warned us not to have a starter with the meal as the portions were huge. How right he was. The landlady could not have been more accommodating, she even did our washing for us. After a good nights sleep we were met by Chris and driven back to the airfield. Again in the morning the weather for the Liverpool area was not good but as it was forecast to improve, we sat and waited for a couple of hours before leaving for Caernarfon. Despite setting off in good conditions by the time we got south of Woodvale we were getting lower and lower and the visibility was getting worse so a decision was made to divert back to Blackpool. Having parked near the fire station we were told to report to the GA centre which is in the Main Terminal. Fortunately as this was a weather diversion we were not charged a landing fee but we did feel somewhat out of place amongst the holidaymakers in our flight suits. We got some strange looks. Having sat and monitored the weather situation for nearly 3 hours waiting for the promised improvement we eventually thought we'd give it another try. Whilst we refuelled, the Battle of Britain Flight gave us a fly past which was nice of them. This time, whilst the conditions were not what we would have liked, they were better than before so we kept going and despite being down to 400 feet over the sea we were confident that once we got past Prestatyn and Colwyn Bay the sun would be waiting for us. This turned out to be the case and the rest of the leg to Caernarfon was in glorious weather again, albeit very windy. After a quick leg stretch and a check of the weather we decided to press on to Haverfordwest whilst things were in our favour. Just over an hour’s flight time later we had passed down the beautiful west coast of Wales and arrived at a deserted Haverfordwest with winds that were now becoming decidedly tricky. Refuelling was from the self service pumps and we tied down and put the cover on SY whilst waiting for the taxi that Whitters had booked. When asked to recommend somewhere to stay for the night the taxi driver took us to a Hotel that looked as if it should have housed the Adams Family. We were guided to the top floor of the deserted building up creaky staircases and long corridors by the owner who looked as if he had just got out of a coffin. Despite this somewhat disconcerting feeling we had the quietest night and the best breakfast of the trip at the best price. 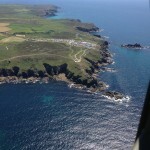 Having paid our landing and parking fees we set off for another long leg to Perranporth. Again we were to run into fairly poor conditions crossing the Bristol Channel and along the north Devon coast; however they were not quite as bad as before and eventually when we got to Bude things were looking a lot better. 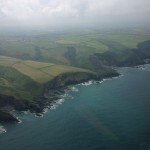 Approaching Perranporth, the Pooleys guide warns of ‘wind shear and strong turbulence’. The radio operator reiterated this and with the wind reported as 17 gusting 27 knots at 80 degrees off the runway direction, this was going to be 'interesting'. Apparently my pre-landing brief to Whitters was 'get out of the bloody way because the stick is going to be all over the cockpit'. And it was. This must rate as probably the worst landing I've ever done. Despite my best efforts to put the into wind wheel gently down first poor SY was skipping and bouncing sideways across the hard runway with the tyres giving squeals of protest and me sweating trying to keep it on the runway and pointing in the right direction. Luckily no damage was done except to my pride. With the wonderful gift of hindsight maybe I should have had another think about this. All the clues were there. As Whitters lives in Cornwall, his wife (my sister) Jackie and daughter Siobhan came out to meet us. I did think about giving them a quick flight but we had a lot further to go today plus I didn't fancy another testing landing so after some photos and another refuel we set off again. The takeoff was marginally easier than the landing. Shortly after we passed that other famous landmark meaning we'd flown from John 'O' Groats to Lands End but having taken 'the scenic route’. 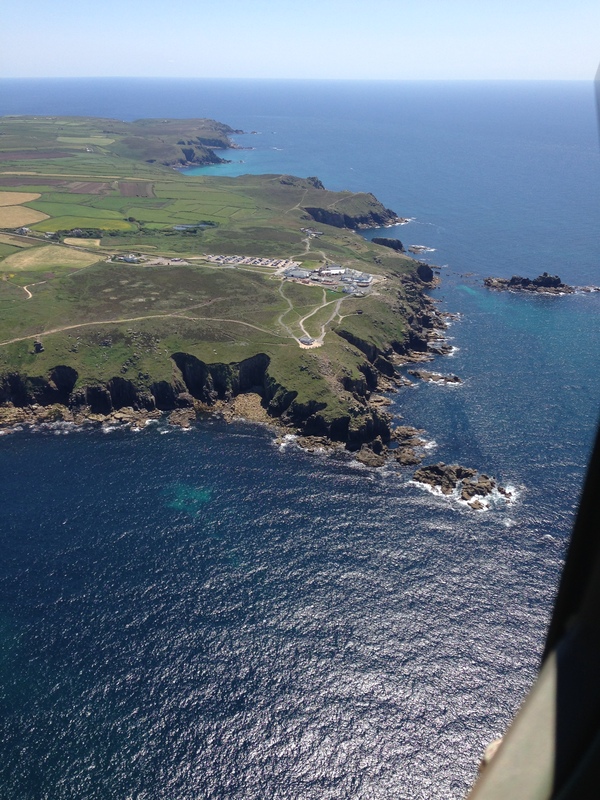 We made a short detour at Truro to fly over Whitters' house and then on towards our next stop at Dunkeswell. Again we ran into some inclement weather at Plymouth and we had to route north of the town to avoid the worst of it. Being a nice Sunday afternoon, when we got to Dunkeswell the place was really busy. We found a slot in the circuit and did our best to fit in but still managed to provoke a hint of annoyance in the voice of the parachute plane pilot when he announced 'going round'. The restaurant here has a really nice Sunday Roast carvery so we thought it would be rude to turn it down. Obviously this had to be followed by some delicious local ice cream as this was to be our final celebratory meal of the journey. Feeling somewhat bloated and a little jaded we set off on what was to be the last leg of the trip. 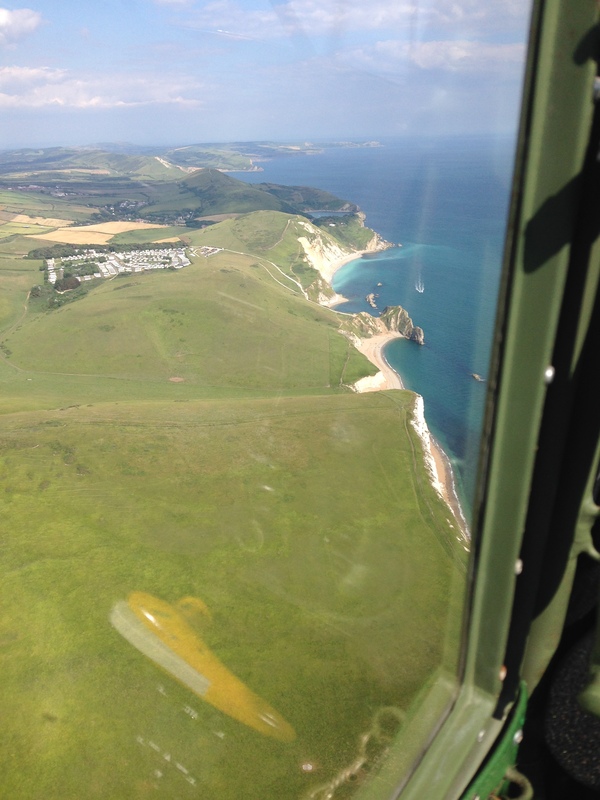 Flying along the Jurassic Coast we were treated to the wonderful sights that this part of Britain has to offer. Approaching the Bournemouth Zone we were now on 'home territory' and despite still not being able to hear the controller properly we were fairly convinced we were ok to continue along the coast. By the time we reached the Solent, where we turned inland towards home, we were both silent as we contemplated what we had done and reflected on this won- derful adventure. About six miles south of the West Tisted, I signed off with Solent Radar and enjoyed the last few minutes of the flight in peace. It was a joy to land on grass again as the last time had been in Glenforsa. Listening to the gyros winding down after stopping the engine is always nice but this time it was special. Finally, exhausted and aching, we fell out of the cockpit for the last time and congratulated each other on our achievement before unloading and putting SY back in her own bed. Arriving back indoors that evening it was time to have a think. We'd done it. The trip had been completed in seven days. This was quicker than we anticipated due to having been very lucky with the weather (apart from some 'challenging' conditions on the last couple of days). Also we had no technical issues at all with the plane, it was superb. Only modern technology in the form of a malfunctioning 2 year old radio, that was doing it’s best to inflict noise torture on me, let us down. We had been privileged to see some of the most beautiful scenery that this country has to offer and to admire it from the best possible viewpoint. Some interesting facts then. We flew 2510 statute miles (in a straight line this is roughly London to Baghdad and I'm not going there!) in a total flying time of 25.5 flight hours (I normally wouldn't do this much in 6 months) consuming 780 litres of fuel (gulp!) and two litres of oil (brilliant). For family and friends we started a Facebook page where we posted pictures and updates daily. We were amazed to discover that the posts on this page had over 4000 views (what???). As aviation trips go this was not in the same league as flying around the world for example, but this was something I’d always wanted to do and was just one of the reasons for buying my own plane. There were several things that made this a lot easier than it could have been. Firstly the weather, how lucky were we with that? Secondly, Ipad with Skydemon, cheating really but it unloads so much work and worry and, with Wifi available in most places, it is so quick to plan the next leg and get all the necessary weather, Notams, times like sunrise and sunset and then simply clip it in, go fly and watch it all unfold. Brilliant. We also met a lot of very friendly, helpful people on the way. Lastly, having a great, reliable companion like Whitters made life so much easier. Despite not being a pilot he quickly became very adept at tying down, putting covers on and helping with co-pilot tasks like having frequencies and charts and necessary information at the ready. Thanks for everything Whitters. I hope we can do another similar trip soon. P.S. Since returning from the trip and writing this article, it seems I may have maligned my poor radio. After two expensive visits by the avionics engineer, three different radios, a new aerial, new (read expensive) co-axial cable, numerous tests and even more headaches, the fault was finally traced to the USB charger adaptor for the iPad. Who would think that this inexpensive item would have given such grief? I only found out by chance after discussing this with someone who had come across the same problem. Ipad with Skydemon is brilliant and I rarely fly without it now, but this caught me out. With more people using iPads I would think this is likely to turn into a common problem. I have since bought a more expensive version from Apple. It is no better. I wish someone had told me sooner.